Firstly, thejudge13 is a passionate investigation into all that is F1. I listen to the comments and observations of the full time F1 ‘nobodies’ and pull the pieces together – or as I often say “read the tea leaves” – to form a view of what really is going on. But thejudge13 is also a social media project. Those who join us on this journey will demonstrate eventually that social media has a voice that F1 should listen to. The vision of thejudge13 is to really bring the F1 fans closer to the sport they love, and we will do this together by pushing the boundaries of social media. To get closer to something usually requires some increase in participation. This begins with those who regularly read the site and by doing so get our Google ranking higher. Then there are those who join in the conversation and comment on articles regularly. This helps build the TJ13 community, with the by-product that you get to make friends and talk to others who share your passion. Then there are others who can give an hour a week or a little more and help us build our factual F1 pages, most of which we try to make interactive with YouTube videos relevant to the subject matter. TJ13 has now 6 other volunteers working on developing the site and the various forms of social media such as twitter, facebook, YouTube and eventually TJ13 TV. So if you can write, tweet, edit video or even just post links to TJ13 articles on other F1 sites you are part of – there is something you can surely do. An old Chinese fable of the creator of the game of chess goes as follows. When the creator of the game of chess showed his invention to the ruler of the country, the ruler was so pleased that he gave the inventor the right to name his prize for the invention. 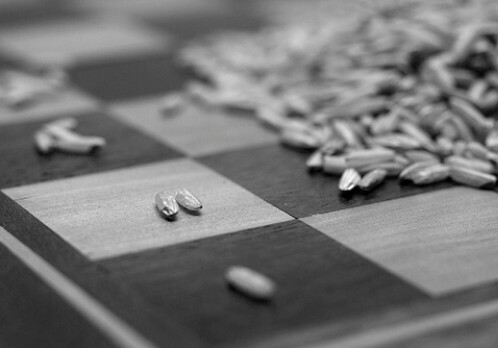 The man, who was very wise, asked the king this: that for the first square of the chess board, he would receive one grain of wheat (in some tellings, rice), two for the second one, four on the third one, and so forth, doubling the amount each time. The ruler, arithmetically unaware, quickly accepted the inventor’s offer, even getting offended by his perceived notion that the inventor was asking for such a low price, and ordered the treasurer to count and hand over the wheat to the inventor. However, when the treasurer took more than a week to calculate the amount of wheat, the ruler asked him for a reason for his tardiness. The treasurer then gave him the result of the calculation, and explained that it would take more than all the assets of the kingdom to give the inventor the reward. Various different endings to the story have been told. If everyone who visits thejudge13 and enjoys what they see and experience – introduces just 2 other people to our community…then as in the chess story explains after 22 iterations this will yield a place where our friends number 1.046 million people. So join us on our journey and lets together enjoy the circus that is F1. Your comments and discoveries are really important as they ignite the issues we can further investigate and explore writing. I just want to mention I am just new to blogging and site-building and seriously liked your web blog. Almost certainly I’m want to bookmark your blog post . You surely have tremendous article content. Bless you for sharing with us your website. Do you mind if I quote a few of your posts as long as I provide credit and sources back to your site? My website is in the very same niche as yours and my users would genuinely benefit from a lot of the information you present here. Please let me know if this okay with you. Thanks! After I initially commented I appear to have clicked on the -Notify me when new comments are added- checkbox and now each time a comment is added I receive 4 emails with the same comment. There has to be a way you can remove me from that service? Thank you! @thejudge13, great job! It’s great to finally find a site dedicated to the intricate politics of f1. I havnt really had the opportunity to test the credibility of your claims, but the way I see it, this is one of the best f1 Taff’s out there. A quick suggestion, how about a smart phone app? It’s long over due, think about it! Bout to get on a plane to no where but will suggest to tech your idea. We had the purple red bull online in video form, 1 week before the launch and Paddy Lowe too. Plus James Allison signing Ferrari contract 10 th July. Ferrari confirm 29th July. and there’ll be much more…. If we introduce 2 new F1 fans (1st iteration) and they introduce 2 more each (4 new F1 fans) (2nd iteration) and so on. This can be expressed as 2^(iteration) thus being 2^1=2, 2^2=4, 2^3=8 and so on. Firstly therefore you would, by the 22nd iteration, have 2^22 new F1 fans = 4.19m new F1 fans. Secondly, I would hope you have retained all the fans that were introduced in earlier iterations.